where others may fail to look. Our lawyers bring to bear decades of experience at the highest rungs of Indiana law. They are known for practical judgment and untiring determination. We aspire to be recognized innovators at both the practice and business of law by creative thought, a flexible approach, and early adoption of technology. Our mission is to address the legal needs of our clients with energy, effectiveness, creativity, and a high sense of honor, integrity, and respect. If you feel like you are going around in circles, we can point you in the right direction. The legal profession is experiencing wrenching change. The future belongs to those nimble enough to adapt. Technology is diffusing the old storehouses of legal expertise. Innovation is occurring in small labs without any surrender to mediocrity. The future clearly belongs to those who can best acquire, retrieve and apply knowledge. Still, “growth for growth’s sake” is pursued as a strategy. The bureaucratic onset and constant tumult that follow tend to shift attention inward, away from client service. Driving statistics, rather than creating client value, too often becomes the order of the day. Densborn Blachly provides a refreshing alternative. It offers the expertise that business clients demand without the baggage that they abhor. Just as law schools divide the law into courses, law firms divide into narrow enclaves of expertise. But the problems and projects of business clients never present in a vacuum nor are so neatly packaged. Densborn Blachly believes that differentiating service requires a more holistic approach. Its value proposition is experienced legal judgment leavened by a passion for business success. Out of shared passion, enduring relationships develop, and clients are better served. 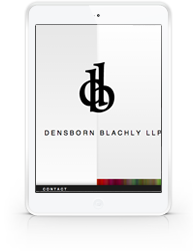 Thus, Densborn Blachly is mission-driven to ensure that its lawyers are well-grounded in the science of business and well-rounded in the practice of law---able to quickly grasp, at least rudimentarily, the client’s business and its position in the industry it serves. Densborn Blachly is proud to serve the Midwestern business community. Midwesterners are independent, competitive, practical and productive. They innovate before they realize they do. They esteem pedigree not nearly as much as getting the job done. Densborn Blachly is of the same ilk. At Densborn Blachly, innovation occurs in the field and on the fly. Practical solutions are found in places previously unexplored. Client interests are protected against underappreciated risks. Desired outcomes are reached through tenacious pursuit. 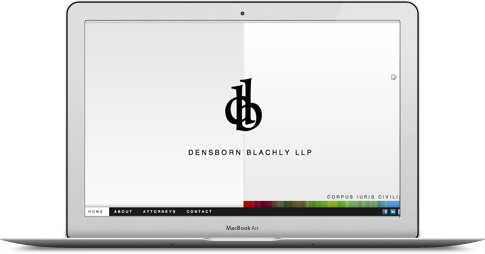 Densborn Blachly lawyers know how to work hard with intuition, creativity and effectiveness honed over decades of experience. And they relish the competition of it all --- just as their clients do.